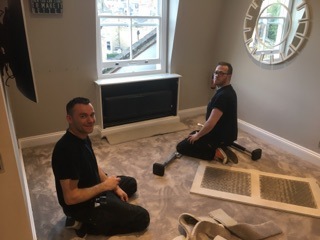 I just wanted to send you a note to say how happy and impressed we are with Aaron and Richard, they did an absolutely AMAZING job in the 2 houses as well as a very tricky job in our office yesterday. Everyone in the hotel is raving about the plush carpet and what a professional job your team did. If I had to mention 1 of the many reasons why they are special, it will have to be their ‘can-do’ attitude, the unconditional willingness to help us in our hour of need. I wanted to let you know what an excellent job Ryan, Stuart, Wayne and Tim did carpeting our property, while it was a pity Ryan couldn't be there for the whole 5 days, we were very thankful that Stuart provided continuity, leadership and knowledge to the effort as it evolved. Whilst I don't wish to criticise the UK worker, I can say that in my 18 years here, I have never seen a team work so hard each day from start to finish. Their dedication to the task is something for you to be proud of - no breaks and a 10 minute sandwich for lunch! A Google User - "Would recommend"
Really happy with my new carpet, very happy to recommend this company. Installers did an excellent job, I loved how they did the little extras even though they didn't have to. I just have to say a huge thank you to all at London Carpet Express! We had an urgent need for some commercial quality stair carpet to match some existing office carpet. London Carpet Express measured up and sent along their carpet fitter with carpet, in plenty of time for our deadline. The men who lay the carpet were chearful, tidy and professional.